This is a great dish for vegetarians or people like me who sometimes just like to take a break from meat! 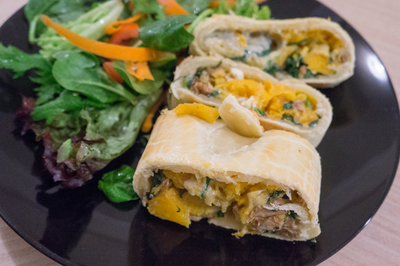 I love the combination of the flavours and anything with pastry is a winner for me. The crunch of the walnuts gives it a great texture mixed in with the delicious melted cheese. Make sure you get the mild blue cheese as it tends to overpower otherwise. A great dish for entertaining as well. Preheat oven to 240 C. Line a baking tray with baking paper. Place pumpkin on the tray. Spray with oil and season. Bake for 10 minutes until just tender. Remove from oven. Reduce oven temperature to 220 C. Place spinach in a colander in the sink, pour over a kettle of boiling water. When cool enough to handle, squeeze excess liquid from spinach. Join pastry sheets together to make a rectangle. Use rolling pin to roll out pastry slightly larger. Cut a 5cm strip from one of the long sides and reserve for decoration. Lightly toast walnuts in a frying pan over low heat. Combine spinach, pumpkin, garlic, cheeses and walnuts in a large bowl. 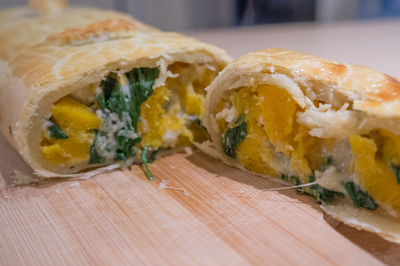 Place spinach mixture along centre of pastry lengthwise. Fold in short sides and then long sides to enclose. Press down on the ends to seal. 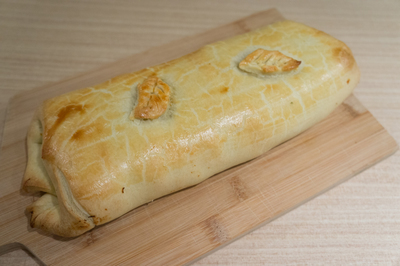 Place the Wellington seam-side down on a baking tray (with baking paper). Cut out leaves or other design from reserved pastry and place along the top of the roll. Brush with egg. Bake for 20 minutes or until pastry is golden. Stand for 15 minutes.